He was so paranoid that it was going to hurt that he just let it get more and more loose until he could bend it completely perpendicular to the rest of his teeth. I finally got him to open his mouth and I just popped it out. It didn't even hurt or bleed. It's bittersweet, when they start losing their teeth. 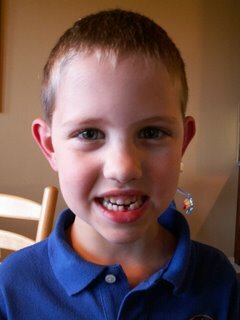 He's growing up so fast; soon he'll have those giant permanent teeth that are much too large for his face. Apparently the tooth fairy pays $5 for the first tooth these days. Inflation is harsh. I sound like I'm a hundred years old, but back in my day, a tooth only fetched $.25!